Here is a pic of my hair the infamous day when my 20 year old curling iron finally got too tired. I may try to replicate this half curled hair! Going back to straight hair! Not totally intentional.......my 20 year old curling iron finally called it quits. I have been wearing my hair wavy for a while now. hair decisions: grow it long? I've had shorter hair for 3 years now....and I think I'm ready for a change. I am missing a big ponytail. Headed to a holiday party? Hosting a holiday party? Make an appt to get your hair done! Bring in one of these photos as inspiration. Am seeing a trend of rock and roll 70's shag hair. Do you like this transition from the lob? Still messy and casual. Ok here is my before & after at Ramirez Tran Salon! What a difference! Johnny Ramirez took the color from brassy to beachy, and Anh Co Tran took the lopsided cut from frumpy to chic. How beautiful is this photo? I love everything about it. I love her hair, the dress, and the flowers. 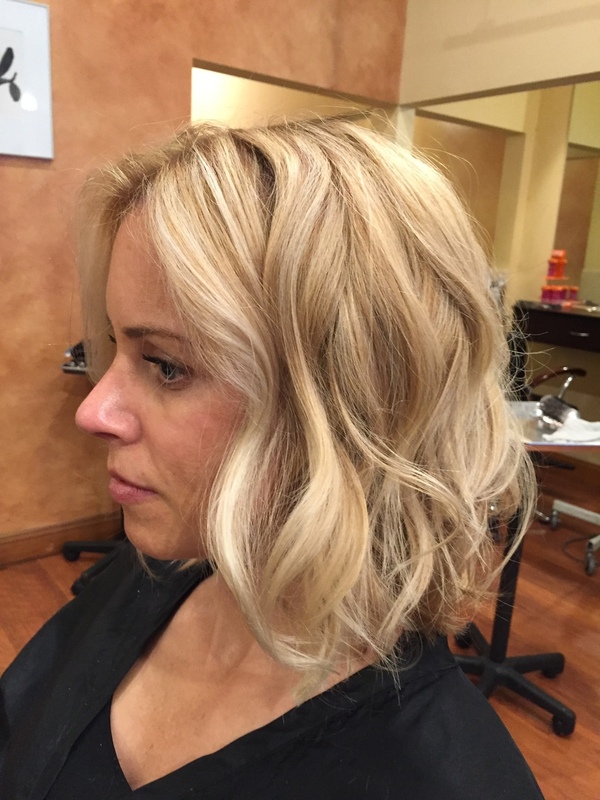 Just came across this really cute short blonde haircut. Very cute! Makes me want to keep my hair short & blow dry it in the morning. Don't you love this hair? Soft, romantic, casual, effortless. Just in time for summer. 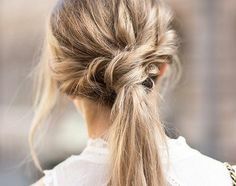 Change up the ponytail and top knot and give this messy twisted half up a try! No, this is not me. This is just a really cute haircut! I debate growing my hair longer again....until I see photos like this. So cute & modern! Some inspiration for your hair for your NYE party. Either try yourself at home, or make an appt at a blow dry bar & bring a photo! I am trying out a new hair person in SF. He advised going brighter blonde & shorter. What do you think? Thanks to Gary at Eclipse Salon! What do you think of this hair? If you're willing to go shorter than the lob, I think this is so cute! Now you have the most popular haircut....how do you style it for lived in texture? Some tips below, thanks to the sweet man who cuts my hair, Ahn Co Tran, and Refinery 29 for these step by step instructions. Start with clean, straight, dry hair. If you have fine, thick, curly, or coarse locks, you'll need to blow your hair out before you begin. Add in a dollop of mousse to boost volume if your hair is fine, or your go-to serum or oil for a smoother blowout on curly or coarse tresses. Continue to curl 1-inch sections all over your head, allowing the strands to cool without disrupting them. Again, be sure that the ends of your hair are not touched by the heat, which will make the look far too polished. (Notice Tran has left the tips of Alaina 's hair out of his iron's clamp.) Allow all your curls to cool fully before moving onto the next step. Grab a can of texturizing spray or dry shampoo — Tran prefers Oribe's Dry Texture Spray — and blast the roots of your hair, holding the spray 12 inches away from your head. Go section by section, and slowly layer the spray into your locks, avoiding the ends. If your hair is processed, dry, or naturally curly, you'll benefit from a texture spray with a touch of nourishing oil instead, like Oribe's Apres Beach Spray. Simply swap it in and follow the steps above. Next, shake out the curls! Using your hands, go in and gently massage your roots and scrunch the length of hair, to muss the curl patterns and make them look effortless. Warm a dime-sized amount of styling cream — Tran swears by Leonor Greyl's Eclat Naturel — between your palms like you would a hand cream, then finger comb your hair back into place. (This technique thins out the product perfectly.) Smooth the ends with any leftover product to keep them frizz-free and smooth. Hair that is naturally curly can also benefit from a heavy misting of anti-humidity hairspray, like Garnier Fructis Style Anti-Humidity Hairspray. Voilà! 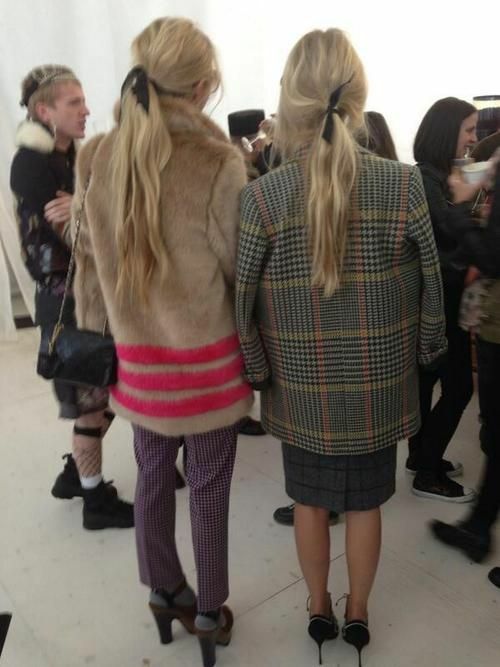 You now have effortless lived in hair. See video below to learn the steps again. 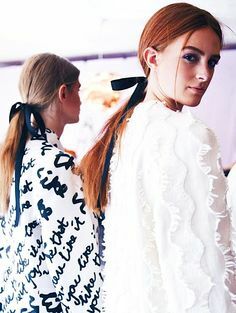 Bows: we used to wear them in elementary school. If you're over the age of 12, can you still pull them off? Based on the chic photos above, I'd say probably. 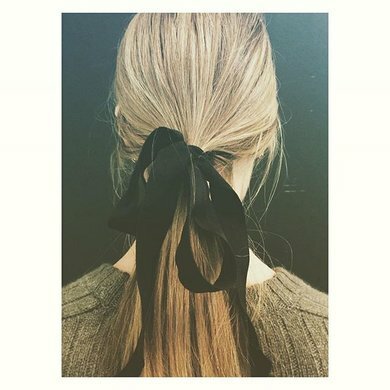 Tips: plain black ribbon, effortless imperfect bow. 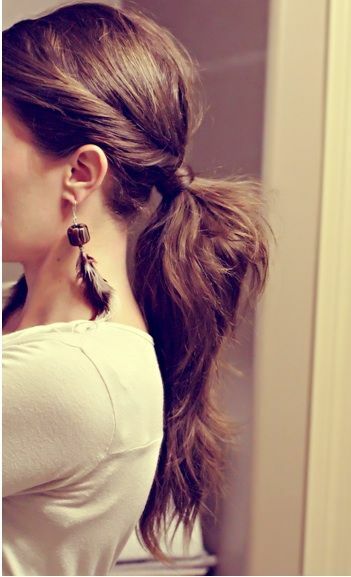 If you haven't cut your hair into a lob yet, here are some beautiful ponytails to inspire you!